Day of the Dead Suncatcher! This sugar skull prism crystal is uniquely designed for the rearview mirror or as home decor! It is created using a two-sided silver sugar skull charm, faceted silver and red crystal beads which are wire wrapped securely by hand to a gorgeous 30mm silver shade prism crystal. 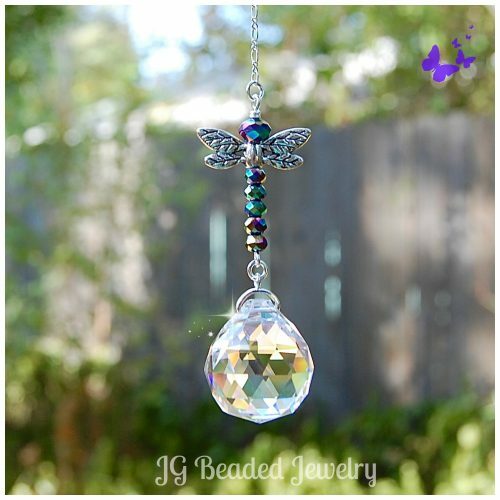 The beautiful silver satin finish on the smoky colored prism crystal makes this suncatcher visually pleasing! You will find that it gives off amazing rainbows when in direct sunlight! ♥ Fast shipping and tracking provided. If you would like more than the quantity available, please contact me with your request! ♥ Available with silver beads here! ♥ Find more Rearview Mirror Decorations, Crystal Suncatchers and Light/Fan Pulls!